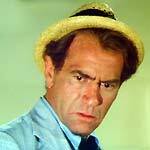 Universal Playback will release the influential 1974 ABC series Kolchak: The Night Stalker on August the 21st. The series, which starred Darren McGavin as a dog-eared maverick newspaper reporter who specialises in investigating paranormal activity, was a key inspiration for Chris Carter when he created The X-Files. The five-disc set will feature twenty "digitally re-mastered" episodes (although not the two TV movies that spawned the series, The Night Stalker and The Night Strangler). This means that the UK edition has a significant advantage over the US edition, which is offered on Universal's notoriously-troublesome DVD-18 discs. There are some issues with the UK discs, though: there are some very noticeable instances of PAL artefacts, especially on Kolchak's crumpled pinstripe jacket (an example of this, and menu screens from the new release, can be seen here). The RRP is £34.99. 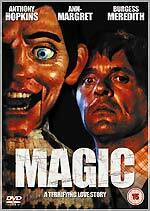 Anchor Bay is releasing a very nice two-disc (two x DVD-5) Special Edition version of Richard Attenborough's 1978 BAFTA and Golden Globe-nominated thriller Magic on August the 21st. Disc one contains the feature, which is presented in 1.78:1 format, with a choice of Dolby Stereo 2.0 (192kbps), Dolby Digital 5.1 (448kbps) and DTS 5.1 (768kbps) audio tracks. Disc Two contains eighty minutes of bonus features: Screenwriting For Dummies featurette (15m); Fats & Friends featurette (27m); interview with cinematographer Victor J. Kemper (12m); 1978 interview with Anthony Hopkins (3m); 1978 Anthony Hopkins radio interview (1m); English and Spanish radio spots (1m); English and Spanish TV spots (8m); English trailers (2m); stills gallery (4m); and a makeup test for Ann-Margret (3m). The RRP is £14.99. Menu screens for this release can be seen here. 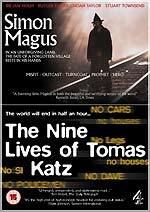 Fabulous Films and Fremantle Home Entertainment will release a double-bill of films directed by Ben Hopkins, Simon Magus and The Nine Lives of Tomas Katz, on July the 31st. Simon Magus, which is set in rural Europe in the 19th century, is about a young man who's exiled from his village because he believes that he's possessed by the Devil. It stars Charlie and The Chocolate Factory's Noah Taylor, supported by an eclectic cast, including Stuart Townsend, Army of Darkness' Embeth Davidtz, Amanda Ryan, Rutgar Hauer, Ian Holm and the late Cyril Shaps. The Nine Lives of Tomas Katz is a bizarre modern-day fantasy film about a chaos-inducing shape-shifter, featuring Thomas Fisher and Rome's Ian McNeice. Simon Magus is presented in anamorphic 2.35:1 format. The Nine Lives of Tomas Katz is presented in 4:3 format, Both have Dolby Digital 2.0 soundtracks (at 192kbps). The disc also features Hopkins' debut short, National Achievement Day (27m, 1995) and commentaries on both features (by Hopkins alone on Simon Magus, and with star Thomas Fisher on The Nine Lives of Tomas Katz). The RRP is £15.99. Universal have confirmed that season two of The Rockford Files will be released on August the 21st. The six-disc set features twenty-two episodes, and has an RRP of £34.99. The Incoming page has been updated with dozens of newly-listed titles, and many more additional pieces of information and etailer links. Please take a few minutes to have a browse, and please remember that ordering using our links gets you a great deal, and helps support this site! I've added a few screen-grabs from the BBC's excellent new Adam Adamant Lives! set to the site, so that you can compare them to the previous DVD release, from Revelation Films (who were using the BBC Video transfers from 1991). Like the early Doctor Who recordings, the Adam Adamant Lives! episodes are of wildly varying technical quality. From the episodes I've sampled, A Vintage Year For Scoundrels and Death Has A Thousand Faces pretty much represent the two ends of the spectrum, from the jaw-droppingly good, to the dark and dingy. You can see the comparison here.